The root of Stephania tetrandra S. Moore of family Menispermaceae. Anhui, Zhejiang and Jiangxi provinces, etc. Light smell and btter taste. Big root marked by even thickness, solid quality and enough mealiness. Bitter, pungent, cold; liver, kidney and bladder meridians entered. Dispel wind-damp, alleviate pain, clear heat and induce diuresis. Being pungent with the actions of activating and dispersing, bitter and cold with descending and discharging, it can dispel wind-damp, alleviate arthralgia and clear heat. Rated as the essential herb, it is suitable for treating arthralgia syndrome due to wind-damp for which the damp-heat is the predominant factor, sour and heavy sensation of the limbs, red swelling and pain of joints, and often combined with other damp-removing, heat-clearing and arthralgia-relieving herbs, such as Hua Shi, Yi Yi Ren, Zhi Zi and Can Sha, as in Xuan Bi Tang from Wen Bing Tiao Bian. For arthralgia syndrome due to wind, dampness and cold, it should be combined with wind-damp-dispelling herbs, or meridians-warming and cold dispelling herbs. For example, Wu Tou and Rou Gui, as in Fang Ji Tang from Qian Jin Fang. Being bitter and cold with the action of descending the adverse flow of qi and induce diuresis, it can clear heat and induce diuresis to alleviate edema. 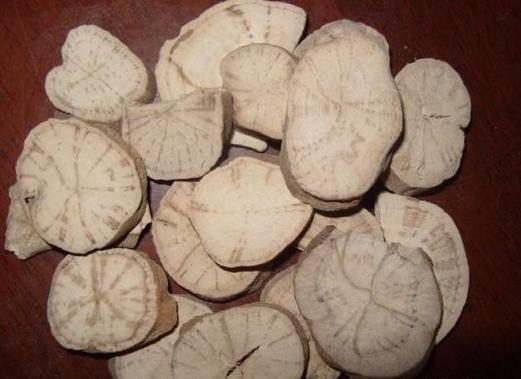 Rated as the commonly used herb for treating edema and difficulty in micturition, it is especially suitable for above condition caused by excessive damp-heat in lower energizer, and often combined with heat-clearing and diuresis-inducing herbs such as Jiao Mu, Ting Li Zi and Da Huang, as in Ji Jiao Li Huang Wan from Jin Kui Yao Lue. It is much powerful in the action of inducing diuresis to alleviate edema, and can be used for treating edema due to yang deficiency when being combined with yang-warming and qi-replenishing and diuresis-inducing herbs. For example, Fu Ling, Gui Zhi and Huang Qi, as in Fang Ji Fu Ling Tang from Jin Kui Yao Lue. In addition, it can also be used to treat downward flow of damp turbidity to the foot, algesic edema of feet and legs, eczema and sores. 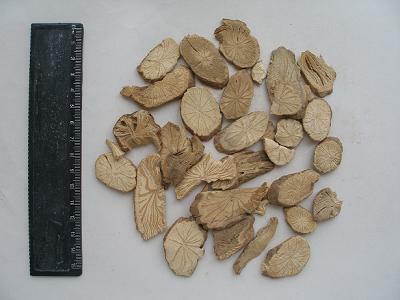 Being bitter and cold, it can easily damage stomach qi, so it should be used cautiously to treat patients with anorexia and weak constitution due to yin deficiency.